Welcome to Turbulence Training Day 1. Home fitness workouts that'll burn fat and sculpt your body in 4 weeks. 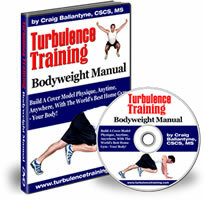 This is day 1 of Turbulence Training's Buff Dudes and Hot Chicks fat burning workout. "Hi there and welcome, I'm Asad from Better4Fitness.com and today was day 1 of Craig Ballantyne's Buff Dudes and Hot Chicks Turbulence Training workout. I have to say, it was pretty tough. It was a lower body and core based workout for day 1, for me that's pretty tough because I've got bad knees! I'm not trying to push myself too hard right now. I don't want to get an injury on day 1, and suffer for the next 8 weeks or even not be able to do the next 8 weeks. It (day 1) was just about finding my form and putting safety first and listening to my body. All-in-all it was a good day! So stay tuned for a fast forward version of today's workout, which is following straight after this. I look a bit stupid =) but it's proof that I did the workout and it gives you an idea of what's involved in the workout. And I'm doing it from home so it shows you, you don't need (hardly) any equipment for these workouts. OK, so I'll see you tomorrow, take care and have a good one!"